The Addtronics 7896A full tower is widely accepted as the best full tower for the serious hobbyist and overclocker. As a matter of fact, the design has only changed a little in the entire time that it has been available. When Addtronics decided to design a WTX case they had a very high standard to live up to. I'd like to introduce you to what I believe is the best available WTX case anywhere: the Addtronics W8500 WTX case. You may be asking yourself why you should consider a WTX case in the first place. This is straight from Intel: The Intel ® Pentium ® III Xeon™ processor at 733 MHz requires thermal evaluation. Care should be taken to select a chassis that ensures sufficient airflow. Intel has tested several ATX chassis and has determined that some chassis provide inadequate airflow, and others require additional fans to generate sufficient airflow through the processor(s). If you are using an ATX motherboard, select an ATX chassis that can accommodate extra 12-cm fans, and perform thermal evaluation following the Thermal Management Notes document. Also, most WTX chassis are designed to make it much easier to achieve the required airflow, especially for higher frequency processors, and most WTX chassis will accommodate both WTX and ATX form-factor motherboards. 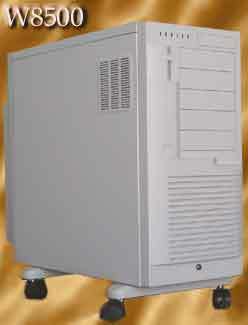 More information can be found on the WTX form factor, including a list of chassis manufacturers, at http://www.wtx.org. Consult your chassis manufacturer for compatibility with your motherboard. While most of us aren't using Xeon processors at home, those who have a hot setup will definately need to consider their cooling. It's nice to see Intel coming around to what a lot of us have known for a long time. Namely, that most cases aren't coming equipped with enough cooling from their manufacturer. I thought the box the 7896A full-tower came in was large. The box for the W8500 is simply monstrous. What is very interesting is that rather than using injection molded foam padding the interior used strategically placed foam to hold the case and other components in place. Components? This case utilizes a rear cover that protects all the cables and keeps nosy hands away from them. Included inside the rear cover were the drive rails and luxury casters. Once I pulled the W8500 out of the box it became apparent that although shorter than the 7896A, the W8500 has more interior volume. Two reasons for this: the unit is nearly 5inches deeper and 2inches wider. You lose one external 5.25" bay from the 7896A and it's internal 5.25" bay, but in all other respects you gain more storage. The design of this case looks to me as though it was designed strictly by an engineer and the art department didn't get much input. The exterior is by no means ugly, but very utilitarian. When I look at the 7896A I see a design that looks like it sprang forth from the design table of an architect. The 7896A has many subtle angles and contours. The WTX W8500 has few if any unnecessary design features. The interior layout and construction screams of a concern for load bearing. There are several LED's on the front of the case, one of them even being for a temperature warning. I don't know of any motherboards that are available on the retail market that support that but the idea alone deserves congratulations. It won't replace the temp. probe I mount on my CPUs with an external LCD display, but in a work environment it would more than serve its purpose to provide warning of a hot CPU or hard disk. This is one of the few cases I've come across that has LED's for four hard drives. That is definately a nice touch for a case that can be used in a server environment. I opened the left side door to see the inside when I was hit with a solid sheet of metal below it. Puzzled, I opened the right side. That's how you get into this case. Curious I thought. What struck me as even more unusual was that the motherboard mounts upside down compared to most cases. The CPU, which is typically at the top of the board, is now at the bottom. While this seems unusual it does allow more room at the end of the board with the PCI and ISA slots. Obviously some WTX boards will have more slots than the standard arrangement that we are accustomed to with ATX boards. There is even a plate there that can be removed to allow two more cards to be placed on a WTX board. An immediate benefit to anyone with an ATX or AT board is that you can use those slots to mount some of the available accessories that require a slot to mount them in. I am speaking of accesories that require a slot to mount their connectors even though they are not mounted to the motherboard. A good example of an accessory such as this is the FrontX accessory relocation device I reviewed. Another thing that is immediately apparent about this case is that cooling was very carefully considered in its construction. Immediately in front of the area where you mount your HD(s) is a 92mm intake fan. To complement that 92mm intake fan are two more 92mm intake fans and an 80mm intake fan. Have a component that produces a lot of heat and fits in a 5.25" bay? The top most bay has an 80mm intake fan next to it. Even better than all this intake capacity is the fact that there are four 80mm-exhaust fans in the bottom rear of the case - next to where your CPU(s) will reside. While I like the impressive fan layout of the 7896A, this layout is by far superior. A new interesting feature added to this case that I've only seen on professional servers is a rear cover that hides (and protects) all the cables where they attach. Add to all this it's tank like construction and you certainly can't go wrong. As delivered it came with the 300w power supply and the optional luxury casters. Those casters are a must for any case this large and cumbersome. Copyright © 1999-2007 TargetPC.com. All rights reserved. Privacy information.